Last April, my husband surprised me with an anniversary trip to Hawaii. The second leg of our trip we spent eight glorious days on the island of Maui. Honua Kai Resort, on Kaanapali Beach’s north coast, served as our home base. Each day, we’d venture out and explore a different part of the island. One of my favorite drives was to the breezy south coast. I adored the winding curves, the scenic overlooks, the wild surf, effervescent beaches, and aquamarine sea. Every so often, hubby and I would stumble upon a beach where driftwood washed ashore. 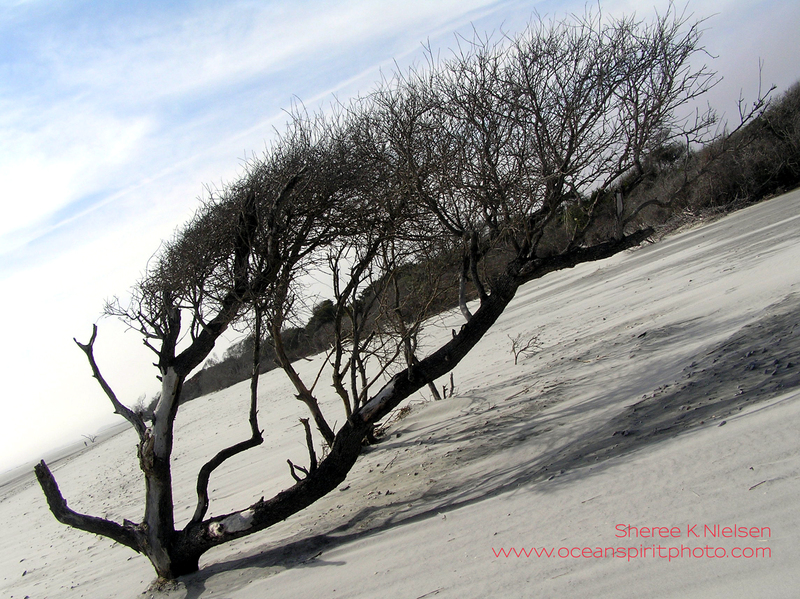 Majestic trees, barren and seasoned by the radiant island sun, told their stories. One such tree, I fondly named the “Lei Tree” , spotted near Ukehame Beach Park. Reposed on the western shoreline, her resilient, sinewy neck lay adorned with colorful leis – each represented a victory she’d won, a battle she’d conquered. She was a true, Hawaiian warrior princess. I often reminisce about that statuesque lady. Her memory makes me smile. 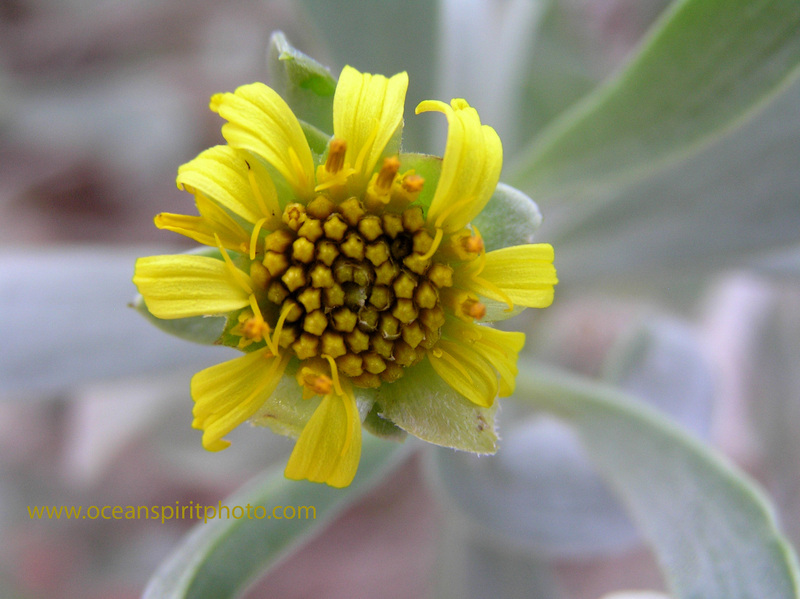 She represents the true ‘Spirit of Aloha’ – arms open, ready to love…ready to give. 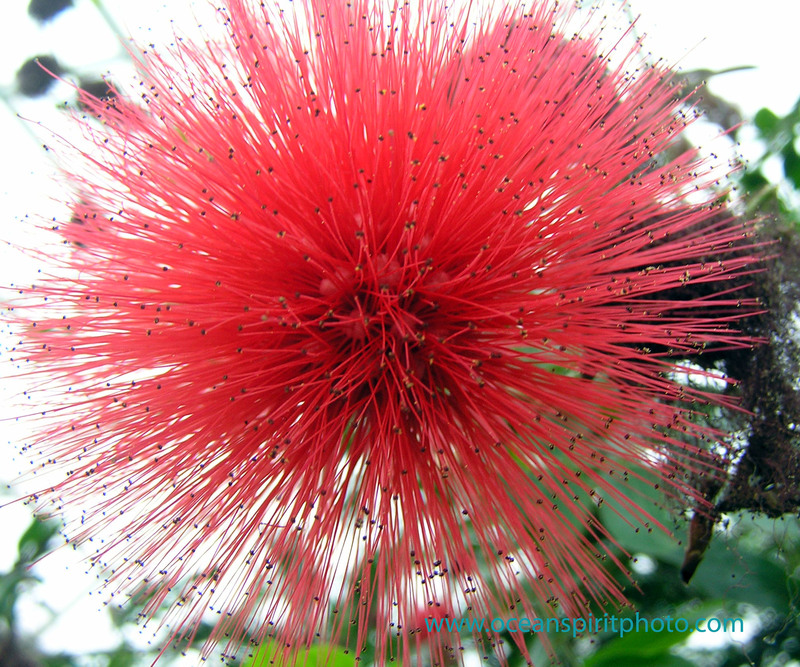 In Hawaiian culture, the spirit of aloha goes well beyond a simple greeting. Maybe our lives would be that much fuller, if we accepted people for who they are…..
Aloha, and Merry Christmas ! 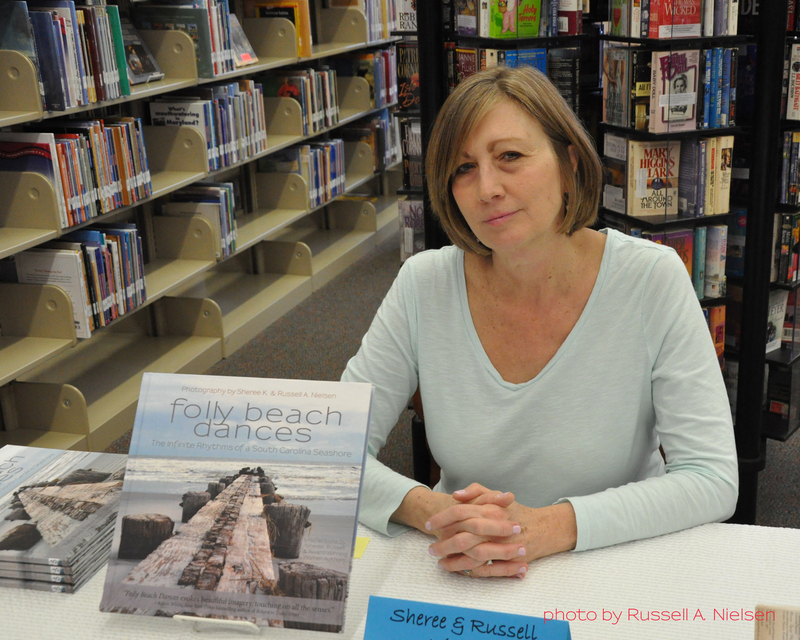 Sheree is the author of three books – Ocean Rhythms Kindred Spirits, Midnight the One-Eyed Cat, and Da Vinci Eye Award Winner, Folly Beach Dances. Last Friday I had the opportunity to speak to the PEO (Philanthropic Educational Organization) women’s group at a church in Ferguson, Missouri. I was invited by author and friend, Deb Marshall and event organizer, Kelly Mazzacavallo. After a lovely lunch of chicken and ham salad, the women gathered in a cozy lounge and settled in comfortable chairs to listen to me talk about “What’s on Your Bucket List” and the story behind my ‘healing’ coffee table book, Folly Beach Dances. I shared with the ladies, that in preparation for the talk, hubby handed me a paper I gifted him a few years ago. The paper’s first words were “Do you remember when?” and reflected on all the crazy and unexpected bucket list items achieved in our travel adventures…like seeing the excitement in my husband’s eyes when we dove Bloody Bay Wall in the Cayman Islands, sailing a hobie cat from Sandals Negril to a deserted island, or even observing a ten-foot pregnant black tip reef shark on a dive in the Abacos. Aptly named for the definition as well as the movie, The Bucket List, stars Jack Nicholson and Morgan Freeman. Complete strangers, fate lands the two men in a hospital room together. The men discover they have things in common – their desire for adventure, and a need to come to terms with their lives. After they are released from the hospital, they set out to check items off both their bucket lists. So, someone’s idea of a bucket list item, may be totally different than someone else’s. That’s how it was for me when Folly Beach Dances was just an idea. In 2014, my idea came to fruition. I was able to cross ‘publishing a book’ off my bucket list. As I spoke about the book’s mission of self-care, healing and positivity, the women listened intently. I selected some of my favorite poems to read. “Circle Dog Dance” written by Pat Wahler, reflects on three dogs laying in a circle on a beach relaxing, not a worry in the world. “The Drifter” penned and photographed by me, reminisces about memories of days gone by and lazy days spent on the beach. “The Fandango” – An old seagull (sporting grey hair on this wings, face, and body) who lives to fly, soar and dive, is penned by Marcia Gaye. “The Twist”, about how often times life seems to be a mess of knots and twisted rigging (by Marcia Gaye). The Twist brought tears to the women’s eyes. After time had run out, the women stepped forward to purchase books. I quickly ran out of Ocean Rhythms Kindred Spirits, my newest release, and Folly Beach Dances. One woman stepped forward and shared how “The Twist” touched her heart, reminding her of a family member going through tribulations. We spoke for awhile, and I offered hopeful suggestions on how to make things better. Our conversation ended with a hug. I thanked Kelly and Deb for allowing me to take part in this quiet gathering. The women where particularly sweet and seemed genuinely interested in my writing. My wish for the day was to stir some emotions, touch some hearts, and be positive. Sheree K. Nielsen is the author of 2015 Da Vinci Eye Award Winner, Folly Beach Dances; coauthor of Midnight, the One-Eyed Cat, and Ocean Rhythms Kindred Spirits – An Emerson-Inspired Essay Collection on Travel, Nature, Family and Pets. Good morning everyone! I hope our neighbors due south are staying safe in preparation for hurricane Florence. Today I’ll be sharing an excerpt from “Life on the Wall”, my diving adventure with friend Sheila and divemaster Zam, about the first time I cast a gaze on Bloody Bay Wall in the Cayman Islands. “Keeping the wall as my visual landmark, I fin-kick and swim downward. Pressure builds in my ear canals. Pinching my nose with my thumb and forefinger, my cheeks puff as I force an exhale, clearing my ears. I missed my blog post Tuesday due to the launch of my children’s book, Midnight, the One-Eyed Cat. For that I apologize. I’ve decided to focus on family for this next excerpt from Ocean Rhythms Kindred Spirits – An Emerson-Inspired Essay Collection on Travel, Nature, Family and Pets. More specifically, my Dad Joe who passed almost 30 years ago, and the comaraderie of friends. Some friends I am still close with today…my LTF’s (or long time friends). The title of this essay is called “The Fix-It Man”, and anyone who knew my dad quickly realized he could fix just about anything. The excerpt takes place in my first home. It’s about all the people that stepped up and took part in doing chores, readying it for my first husband and I to live in. The scene takes place after everyone is tired from a day’s work, and the evening begins to wind down. It’s my favorite scene. I can still remember it to this day. “Upon closer inspection, I noticed a one-inch ring of barbeque smeared around the perimeter of Dad’s mouth. His sticky fingers grasped the ribs as he sunk his teeth into the meat, causing the sauce to drip, drip, drip onto the paper plate. I couldn’t tell if Chris was chuckling at my Dad’s infant-in-a-highchair look or at what he was saying. My father rather enjoyed laughing at his own jokes. 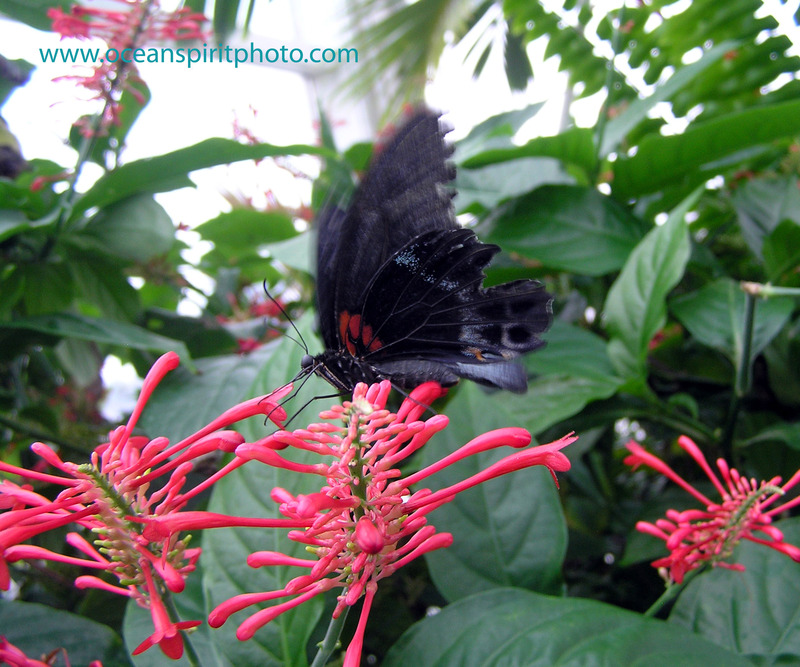 I hope you enjoyed a little sneak peak from Ocean Rhythms Kindred Spirits. I’ll be posting another teaser on Saturday. If you love the beach, nature, the ocean, pets, wild dolphins, sharks and family heritage, you can get your copy of Ocean Rhythms Kindred Spirits here. Have you ever stumbled upon something while searching for something else? So nice to be mentioned by author and editor Trina Sotira, of Muse Write Press in Chicago, from her article in St. Louis Today published December 9, 2017. Her story tells the story of women’s challenges and triumphs in Shifts – An Anthology of Growth Through Change. I am honored my photograph of the “Glass Window Bridge” taken on the gorgeous island of Eleuthera, Bahamas, graces the cover of his powerful book (pictured above). 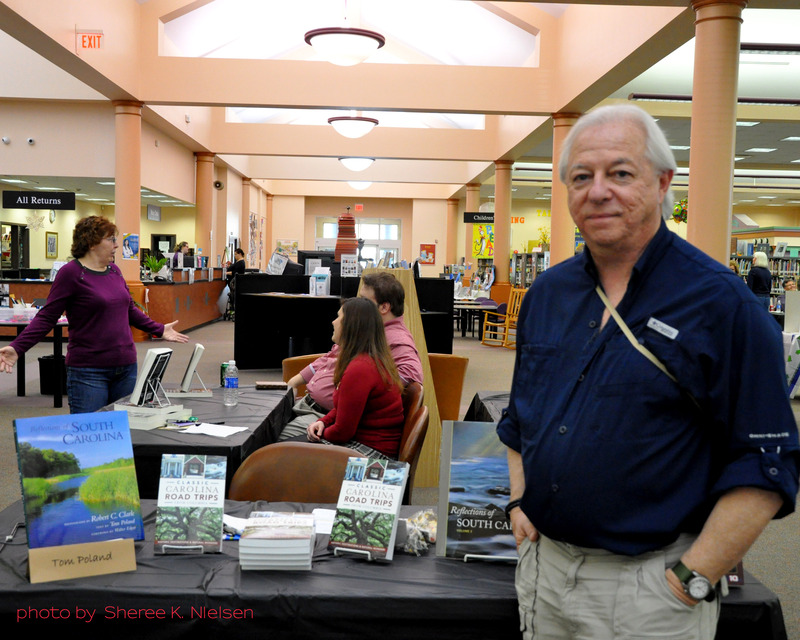 The first week in March, hubby and I set out on a two-city booksigning event for FOLLY BEACH DANCES. First stop was the Tides Folly Beach Hotel. 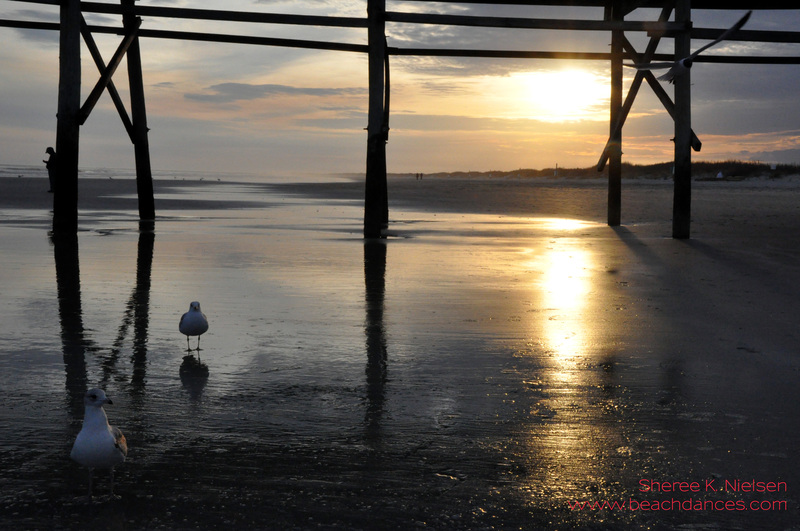 I’d stayed there last September when my long time friend and author, Tina Solomon, visited Folly Beach to market our ‘healing’ coffee table book FOLLY BEACH DANCES. Recognizing familiar hotel faces, I was happy to be back. In our spare time, Russell and I made it a point to enjoy leisurely strolls on the beach. The first morning, we met a twenty-something Lizzie on the pier. As the three of us walked, we conversed. She spoke fondly of her boyfriend in the military. 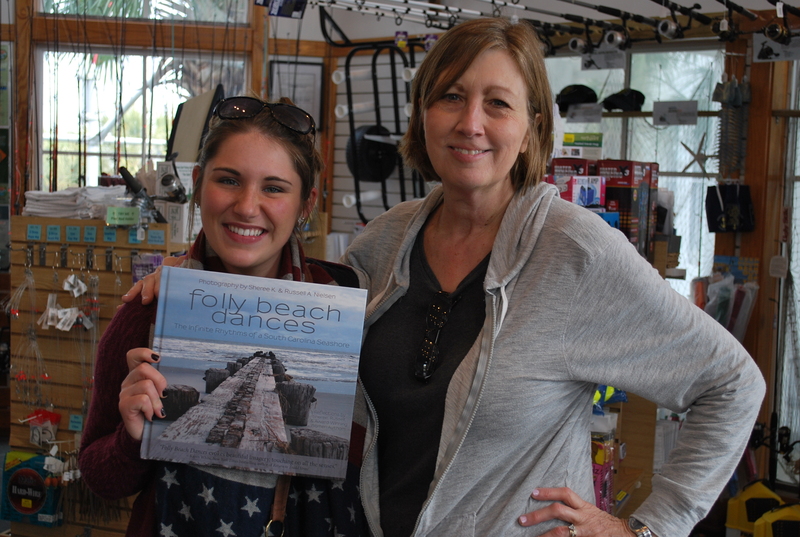 Browsing through the pier’s gift shop, we noticed FOLLY BEACH DANCES on display. Picking up a copy, Lizzie flipped through the pages of the book, and ended up buying a copy. That afternoon we headed to The Preservation Society of Charleston for a booksigning. At first, sales were slow, but by late afternoon we’d hit our stride. What the customers didn’t buy, Evan, the event coordinator, ended up purchasing for the store. A successful event! The next day, we drove to the end of the island to visit the Folly Beach County Park. As I stepped foot on the sand, I felt transported to a Caribbean oasis. The white sand and muted landscape hues, drew me closer to the water’s edge. And the crisp air beckoned windsurfers to ride the ocean’s waves. Walking the shoreline, I followed the island’s natural curves. With unbridled anticipation, I was anxious to uncover visual treasures with my camera’s lens. A weathered tree with branches that mimicked windblown hair, awaited me around the next bend. We bid our goodbye to Folly Beach the next morning, but not before stopping at Bert’s Market – an eclectic hipster produce store. Speaking with Julia, the store’s owner, I was happy when she said she’d carry FOLLY BEACH DANCES! Next stop – Columbia, South Carolina. After checking into Homewood Suites, we met fellow writer C. Hope Clark and husband, Gary, for dinner at Mr. Friendly’s. The time passed quickly as we spoke of writing, publishing, conferences, the beach, and the lake. I thought the waiter was going to kill us for lingering at her table for more than 2 ½ hours! 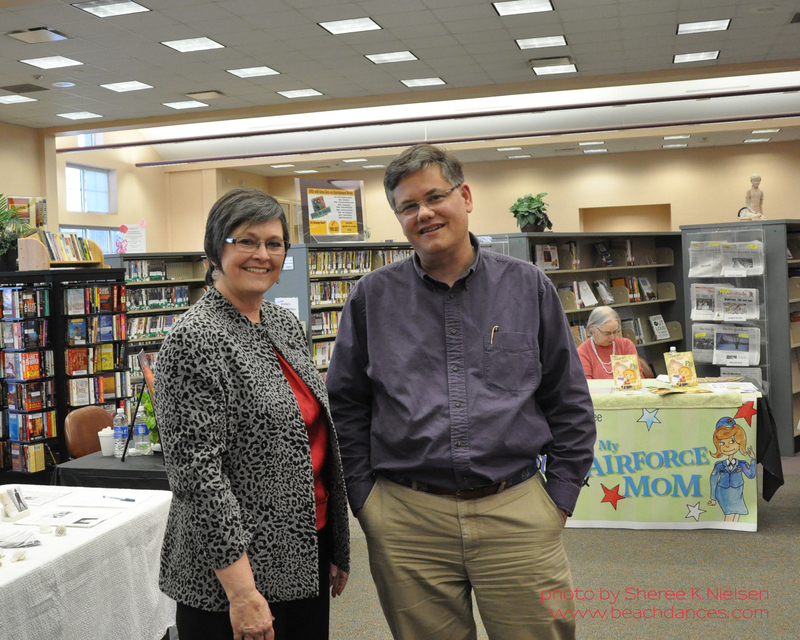 The following day we headed to Irmo Branch Library for a 15-author event. Matt Matthews, author of Mercy Creek, and the First Carolina Novel Prize sat to our right. Hope sat to our left. With her Low Country mysteries, there was a constant stream of visitors to her table. I felt comfortable wedged between these wonderful writers. At the end of the event, I took inventory of our book sales, and realized we did okay. I told hubby, I’d be back, and took some time to find Southern writer, Tom Poland’s table. Co-author of Reflections of South Carolina. I’d seen his book everywhere – even in Missouri. Along with Robert Clarke, Tom created a wonderful journey of photography and essays, weaving personality and character into the book’s colorful pages. Tom and I chatted for awhile, and I learned of his humble beginnings in writing. Back in the 70’s, he had a wild idea to take to the road with Robert. With no plan in mind, they’d write and photograph whatever they found interesting. And they never looked back. We shook hands, exchanged business cards, and agreed to meet again whenever in the South. The car loaded with suitcases, we set course for our next destination – Sunset Beach, North Carolina. Three hours later, we pulled into the parking space of our beach rental, the Graham Sporting Goods house. Friend and fellow author, Jacqueline DeGroot, stopped by for a visit the following night to talk, watch the sun set below the horizon, and drop off her recent book releases – The Cemetery Kids series. I snapped a photograph of Jack for an upcoming story. The next three days were bliss. Lazy days spent walking the beach – in the morning, the afternoon, and at sunset. Oh, the sunsets. The sunsets were divine. When not on the beach, we’d hop in the car and putter along Shoreline Drive, gazing at the gorgeous homes, with the intercoastal waterway in the distance. 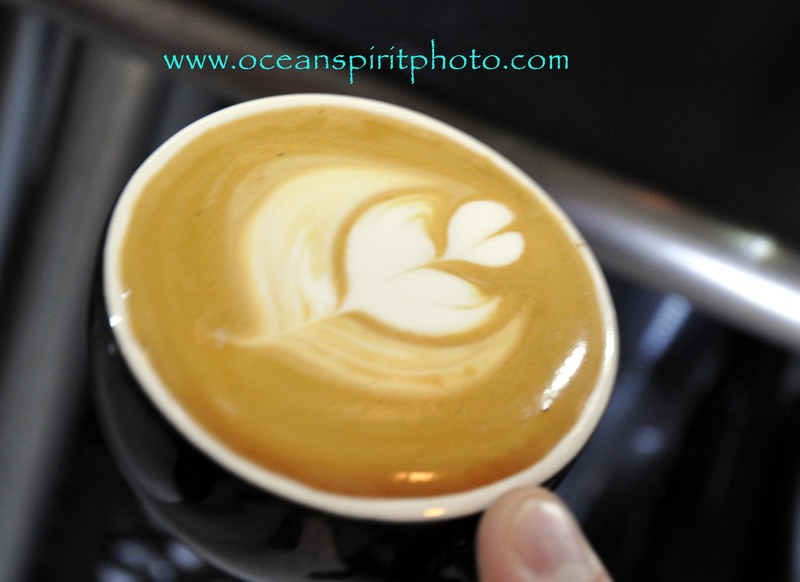 We’d stop at our favorite coffee shop, or just shoot photos of flowers, birds, or landscapes. Oh how I love Sunset Beach. We made some new furry friends along the way. 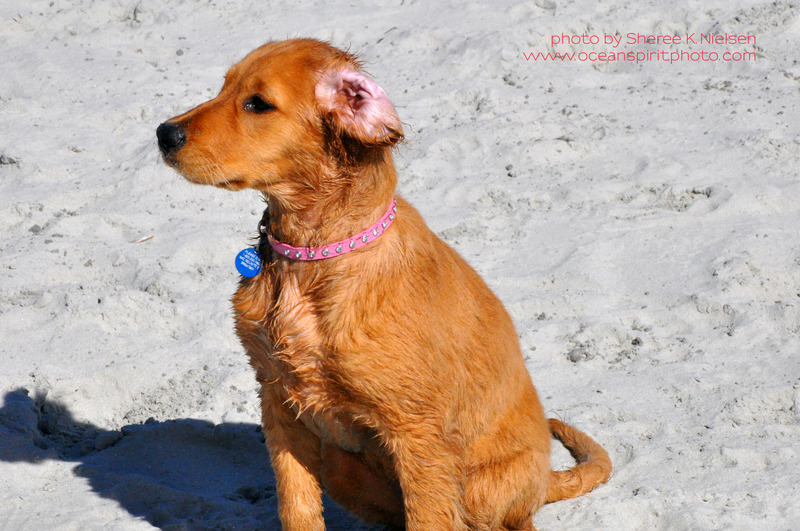 Sassy and Libby, whose owners live in Little River, came down for a beach visit. 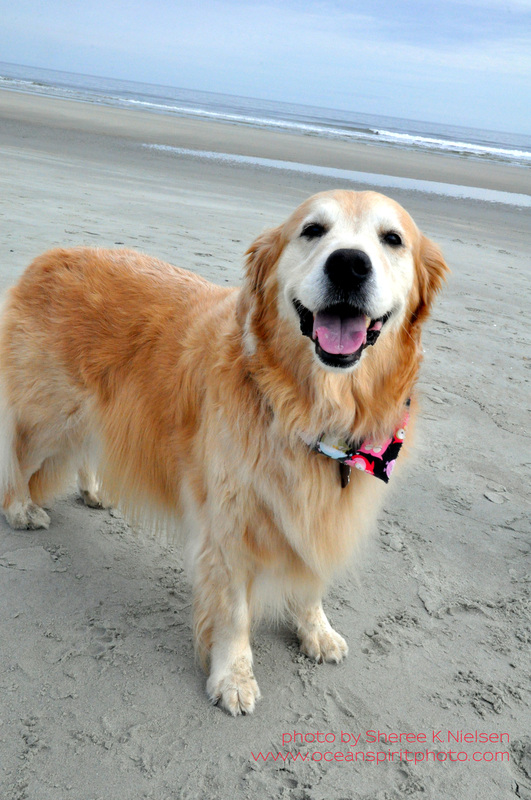 We met Emmy, a sweet golden, who lives a short five minute walk from the beach. Needless to say, we’ll be back in Sunset in May with our fur babies. They’ll get to meet Sassy and Libby, and maybe even Emmy. I know they’ll see their friend Mosa, a boxer, who vacations the same week every year. Oh yeah, the first day of our trip, FOLLY BEACH DANCES was nominated for the Eric Hoffer Award, including a finalist for the da Vinci Eye Award, for excellence in book cover design. So, all in all, I’d have to say, we had a great trip. It was a Wednesday. 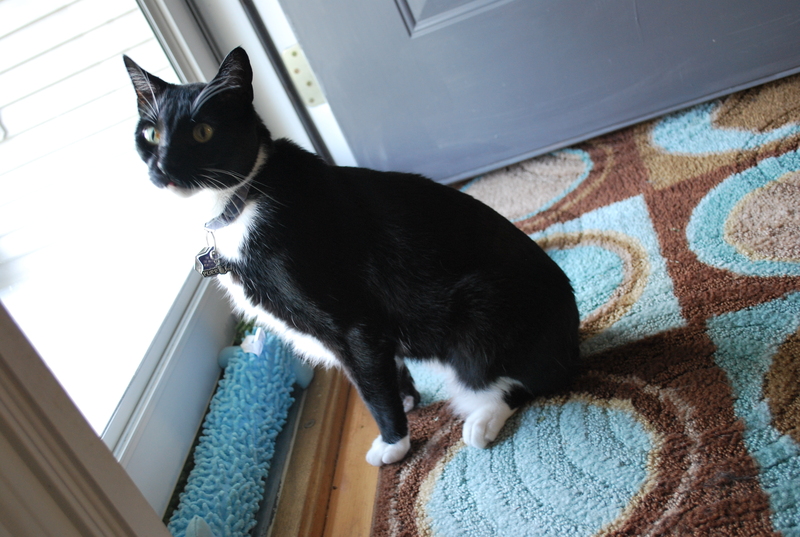 I’d only been gone a couple hours running errands, when I returned home to find my sweet tuxedo cat, Mr. Trip, passed away on the wool rug in our dining room. He lay in the spot where I usually placed my feet under the table, when working from the dining room chair. Devastated, my sobbing began from the time I found him, and went on for days. There was no rhyme or reason to my crying. It happened anywhere, anytime, under any circumstances. When a full week had cycled, I cried on the one week anniversary of his death. Wednesday, February 4 was different, though. 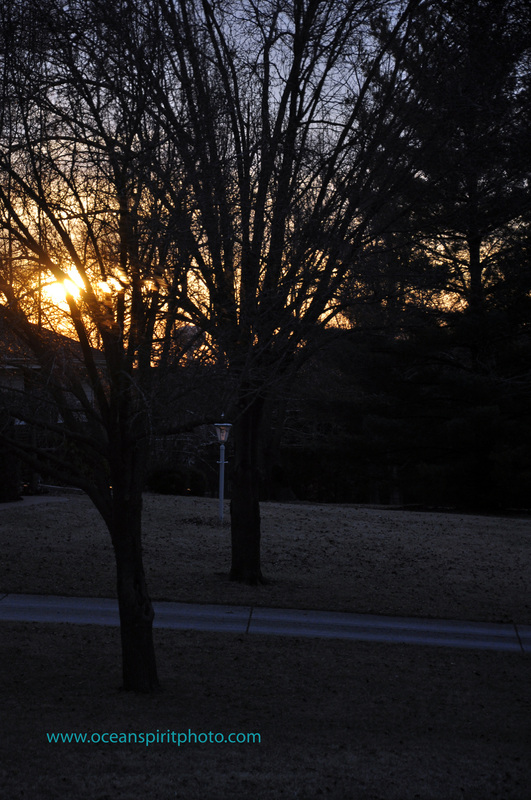 In the quiet of the morning, I was startled by a loud male voice. I sat up immediately, eyes wide open. Wake up to my surroundings? As I arose from our king size bed, I slipped on my socks and robe and stumbled to the kitchen. Two pooches and one cat followed. As I pushed the sheer curtains open in the dining room bay window, the most magnificent yellow-orange sunrise radiated across the sky. I smiled. A peacefulness filled my heart. Sauntering in the kitchen to prepare my breakfast of oatmeal and raspberries, I eyed the resident gray squirrel outside. 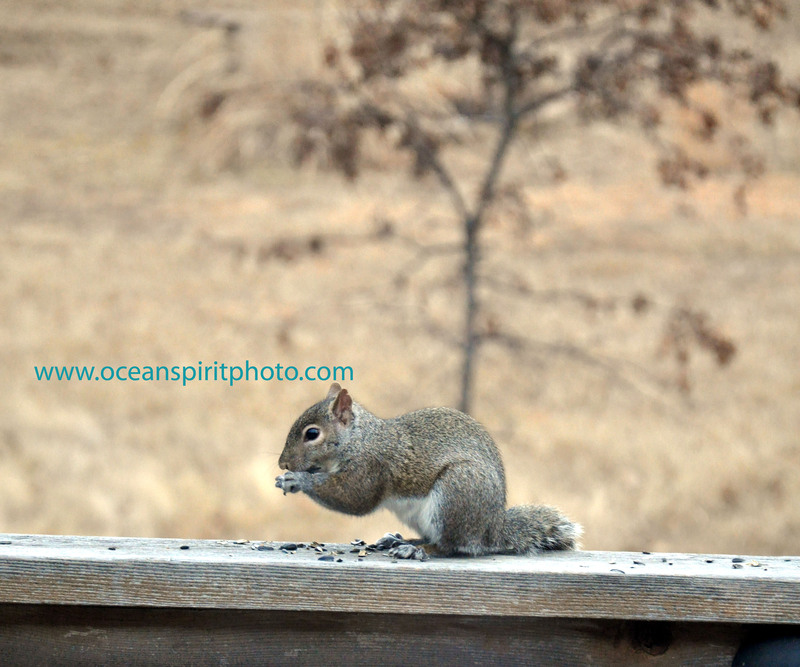 Inching his way down the wooden deck rail, he separated sunflower seeds from their hulls, munching on the meaty treat inside. Seated at the kitchen table with my oatmeal, rye toast and English Breakfast tea, I noticed a pair of cardinals hopping across the deck outside our French doors. I felt like God was telling me to ‘wake up’ and embrace the beauty around me. The visuals of nature helped me forge through the rest of the week. I cried a little, but remembered the beauty I’d discovered on that Wednesday morning. February 11, in the wee hours of the morning, I had a dream. In the dream, I awoke from slumber. The back rear door to our vacation home was open, and welcoming sunlight poured in. The hardwood floors of the hallway were cool to my feet. In the living room, my husband relaxed on a plush beige sofa. I didn’t notice our Australian Shepherd at first, but when she emerged from behind another sofa, a cat was riding her piggyback. As I approached my smiling canine, I studied the cat’s fur and color. His body, mainly white, sported light grey spots. The reddish-brown color of his head and face were separated by a white part traveling from his crown to his nose. Awaking from the dream, I thought the cat reminded me of a parrot. I smiled. After breakfast, I scuffled down the hallway to the bathroom. Squeezing the toothpaste tube, a tiny bubble formed, and floated upward. The small masterpiece remained airborne for at least five minutes. I watched the bubble travel about the bathroom in amazement. First up, then down, then sideways, toward the window, over the tub, and back towards me like an astronaut weightless in a space capsule. I stepped into the bedroom to grab my camera to capture a shot of the bubble, but when I returned it was gone. Later in the afternoon, my young friend Rileigh and I ordered lunch at a local coffee house. When the server delivered my salad, the dressing rather than on the side, was on the salad. I explained my original request. The server politely offered to make a second one. Upon his return, he handed me two tokens for any coffee beverage and apologized for the inconvenience. 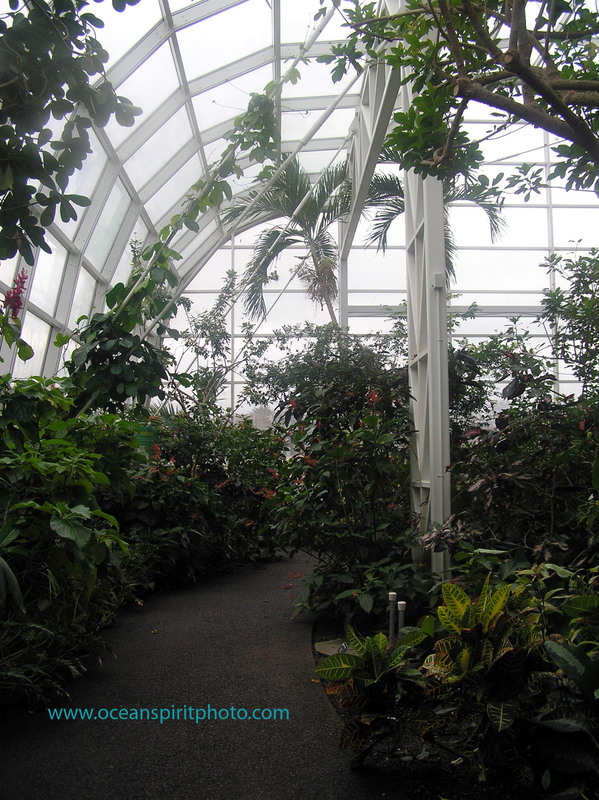 After lunch, we visited the Sophie Sachs Butterfly House, and observed more than 20 varieties of butterflies in a humid glass-enclosed structure. The smell, the flowers, and temperature of the habitat brought back memories of my visits to the Caribbean. Blue Morphos floated past us, just like the toothpaste bubble. Rileigh and I sat on the custom wood benches and observed. Our heart rate slowed as a calmness filled our bodies. We concluded the afternoon with a trip to a local bakery called “The Cup” to stuff our faces with sweet delights. Although the events of a particular Wednesday left a somber and melancholy feeling in my heart, I believe God’s loving arms helped me realize Wednesdays are to be celebrated – whether through death, or a new life, or a change. I believe that my sweet fur baby, Mr. Trip, running free on Rainbow Bridge, would want me to savor all the good and positive moments that Wednesdays bring. I’ve decided that Wednesdays are ‘get out of jail free’ days – a break from the crazy world of stress. I look forward to more unexplained sweet ‘awakenings’ in my life, and know that God always plays a part.